Negative space is a tint area of black color, but in case of tattoos art it is the skin, left uncovered by ink and adopted by ink lovers. They are created in the shape of dot work, blackwork, tribal and graphic style. Further different styles are also used but this depends on the culture and environment. Negative space tattoos are originally created in European countries people especially young generation and now this trend is used and adopted all over the world by a lover to express their talk of mind and heart. Tattoos are created on the body in different shapes and designs to show something to someone special. At the beginning of true love and friendship, people find sources to show their feeling and tattoos designs are considered one of the great and useful sources to express their emotion or feeling what you have. 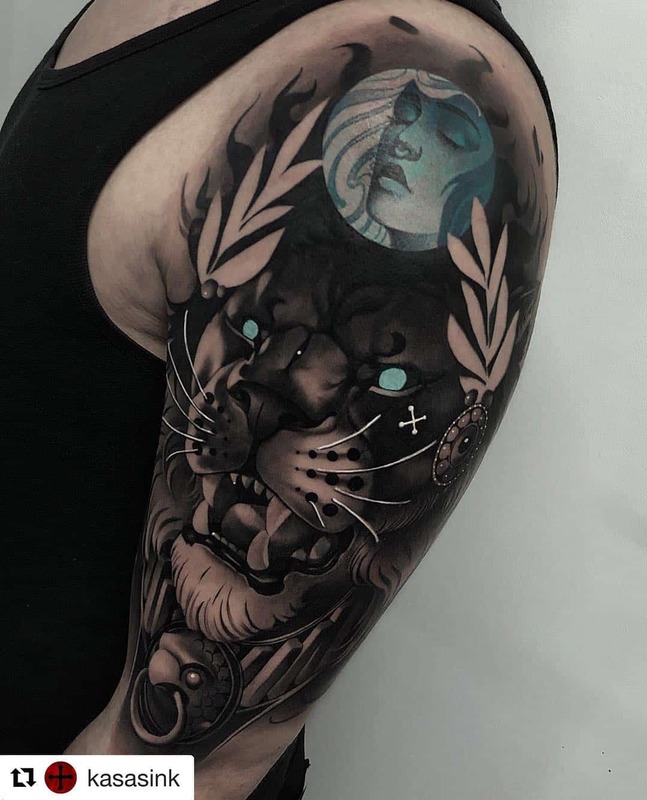 Tattoos creating become art and this art is also the big source of earning and for that purpose many of the beauty polar starting creating this art. Lower back tattoos are already discussed in the previous article on this site; you can visit them and enjoy the beautiful collection. Today we have a great collection of negative space tattoos which represent the lovely feeling and some designs are shows like losing someone or hearting, someone. 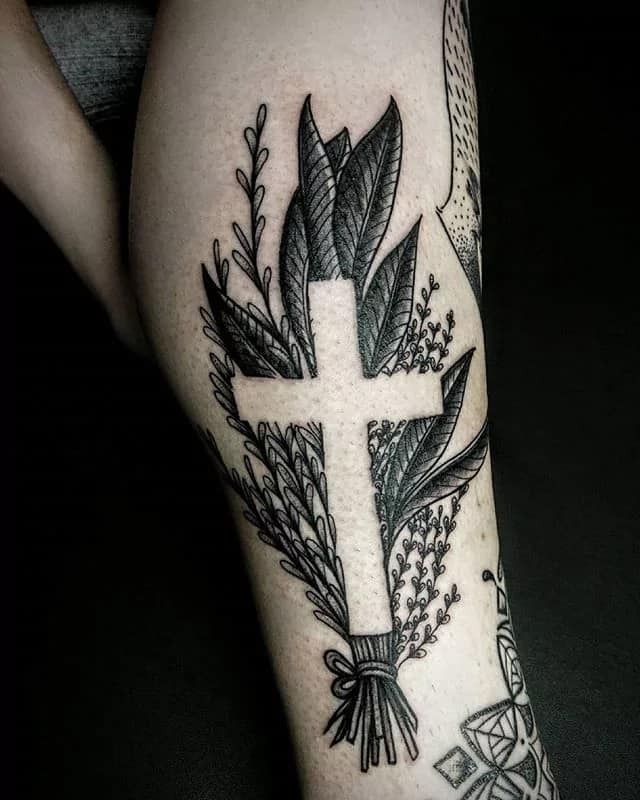 These tattoos designs are also applied on the body and on the special area due to a request by someone and most people face all the pain related to applying tattoos and managed money sometimes in a difficult situation but they do it, this spirit shows the true love. Now you can see our beautiful collection and select one of these to show their heart voice. We sure about these designs that they will helpful to you to show their voice without talking. 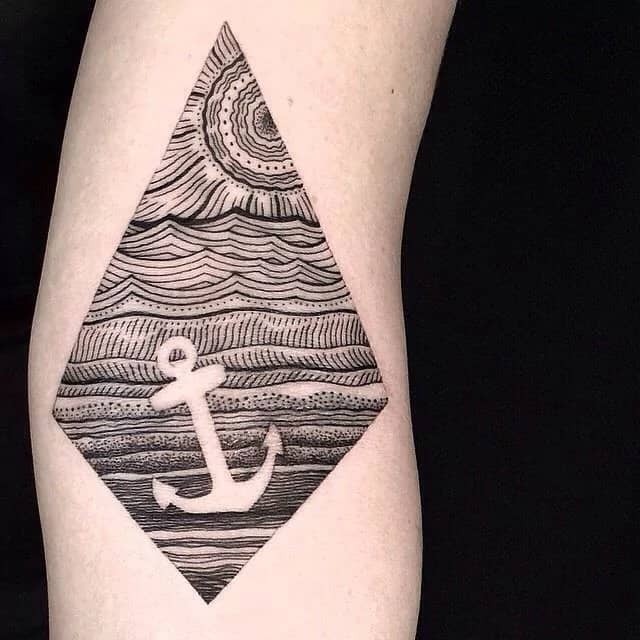 An awesome line work with an anchor as a negative space tattoo. Anchor tattoo symbolizes a lot of meaning .i.e. salvation, steadiness, hope, perseverance, and protection. It is giving a strong message .i.e. hold like this negative space anchor tattoo in the time of difficulties or ups and downs. Birds, Trees, moon, and a horse rider. Surely a mesmerizing negative space tattoo. Flying birds symbolize the freedom. Trees symbolize the security, wisdom, growth, and knowledge. Full moon symbolizes the feminine nature, supernaturalism, and creativity. The horse symbolizes the elegance and power. Simple, but definitely is full of charm. 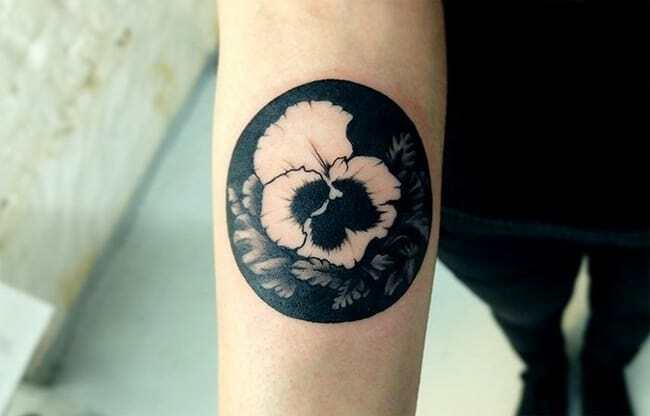 Negative space hibiscus arm tattoo symbolizes the royalty, bravery, kindness, purity, and honor. It is exhibiting a very deep meaning. One flower looks opened while the two flowers look closed. 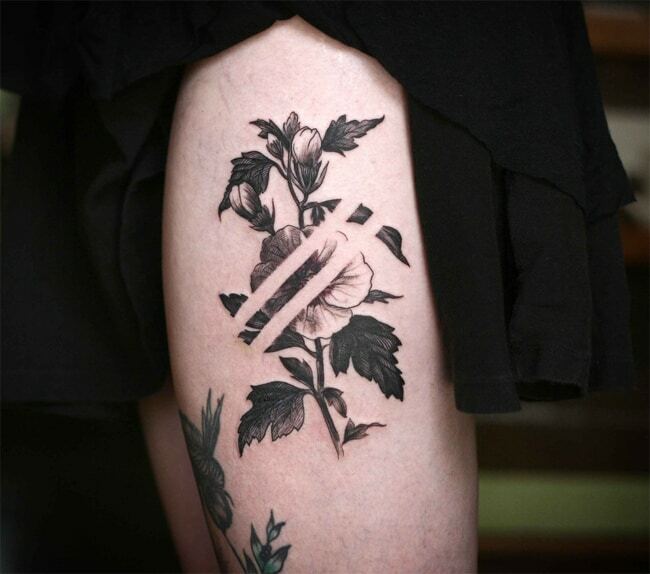 The two parallel lines as a negative space tattoo reveal the “equality” among these flowers. Are you looking for a tattoo as your armband? 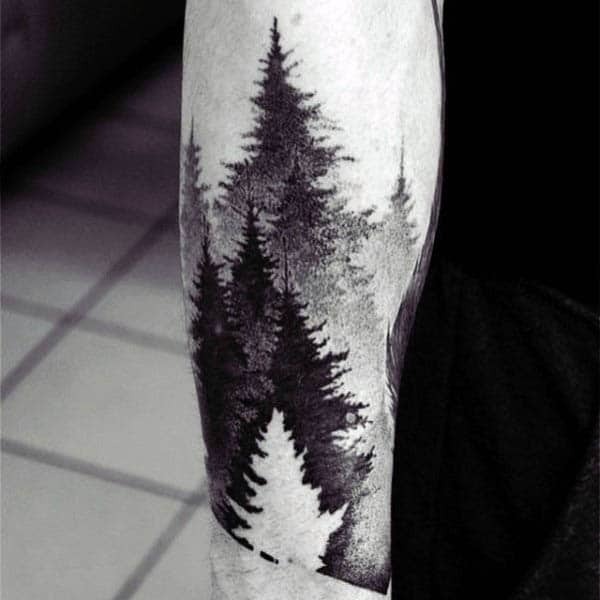 Then why not to try this elegant pine trees as a negative space tattoo. Pine trees symbolize the security, abundance, forgiveness, growth, and courage. It is really a food for thought. The tree is symbolizing the growth, life cycle, and immorality. The graves are for the realization that death is the destination and reality of people’s life. The Cross sign symbolizes the people’s faith and believes related to Christianity. A negative space hand tattoo grabbing the cat looks very affecting. 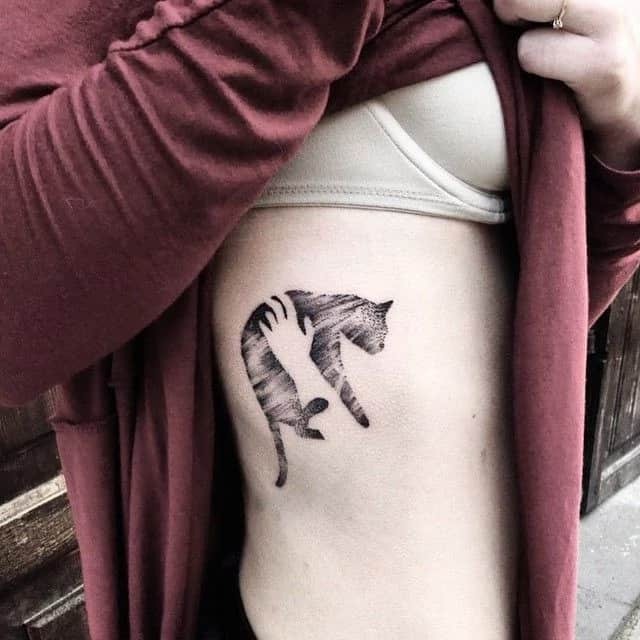 Cat tattoo symbolizes the cleverness, wisdom, and an attitude nature of a girl. Here, the hand is playing the role of holding the girl’s tantrums. Unbelievable! 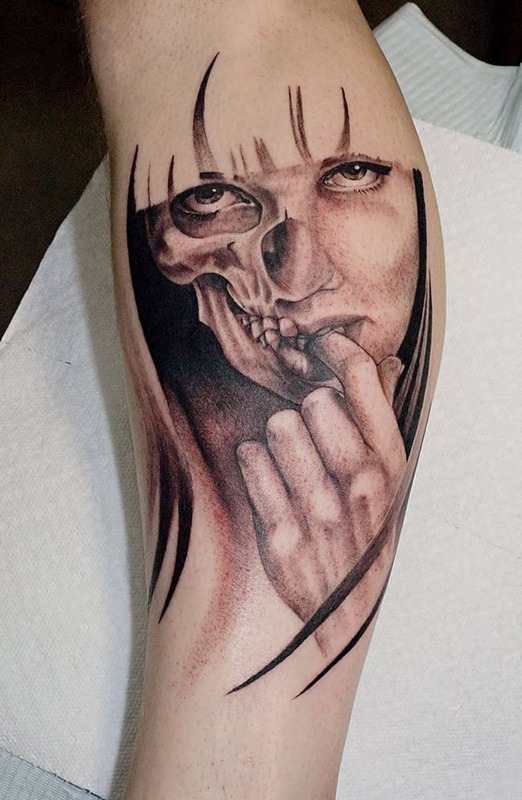 Is it really a negative space tattoo or a monochrome picture pasted on girl’s hand? Hold on! It is really a tattoo. Mountains symbolize the mental improvement or enlightenment. Pine trees symbolize the salvation and security. It is an innovative and inspiring negative space tattoo. Half face and half skull blended very professionally. It may possess several meanings according to people’s perception. 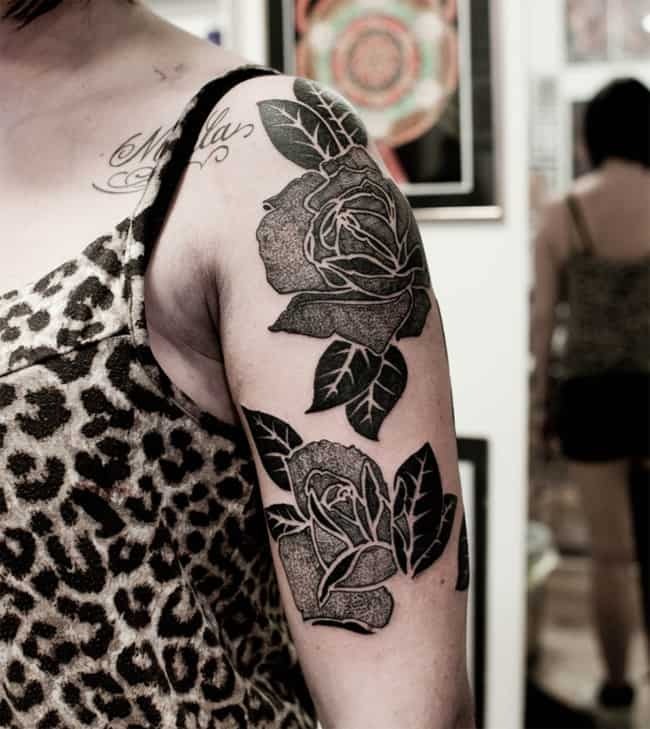 Beautify your half sleeves by embracing the adorable roses as negative space tattoo. These roses symbolize the love, purity, beauty, person’s maturity about love, and hope. 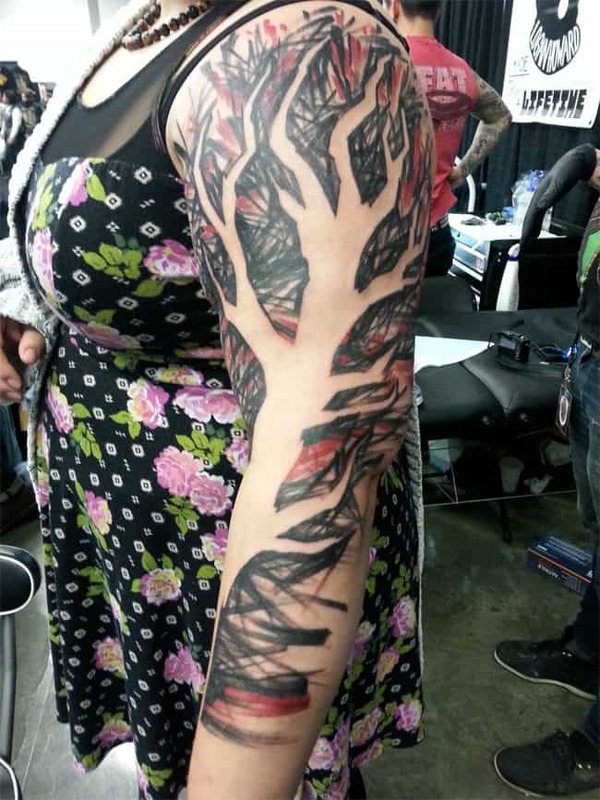 You will surely astound after taking a deep glance at this negative space tattoo. It is no doubt a perfect tattoo for plus a size woman as it occupies the whole sleeve area of her. Tree tattoo symbolizes the perpetuity, wisdom, transformation, forgiveness, and growth. The red color incorporation symbolizes the feminine character. Rat possesses a lot of meaning according to a different region and different beliefs of people. 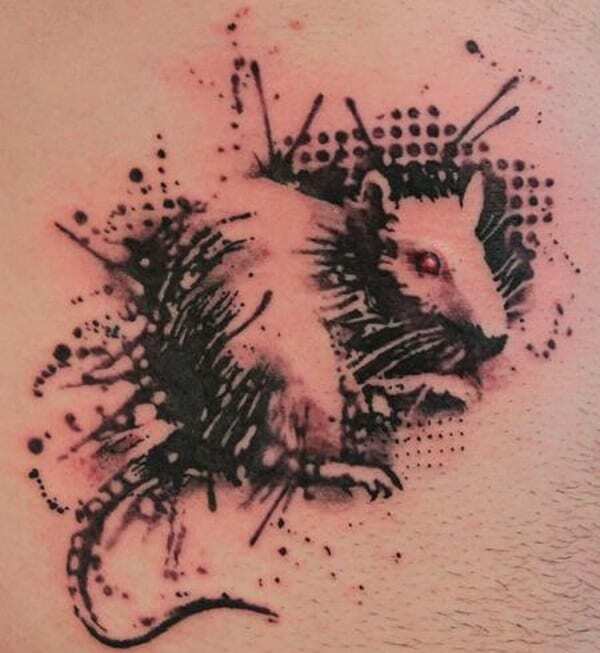 Rat as a negative space tattoo symbolizes the wisdom, cleverness, activeness, and stubborn characteristics of a person. 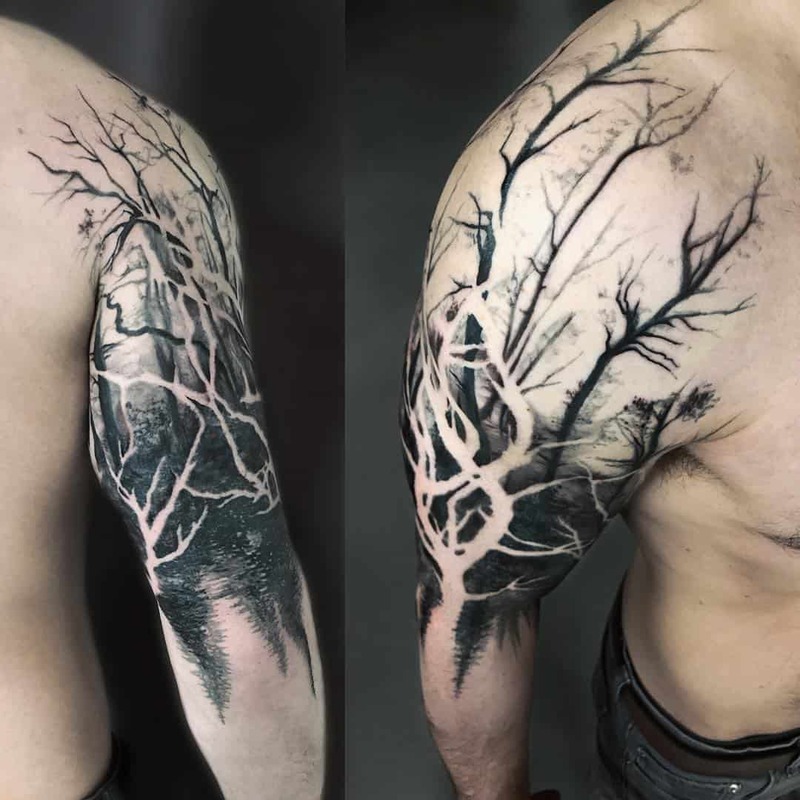 The forest trees without leaves negative space tattoo looks very mesmerizing on half sleeves. The trees look not much refreshing which reveals the struggles of person that he is facing in his life. The tattoo is giving grief or deep impressions. 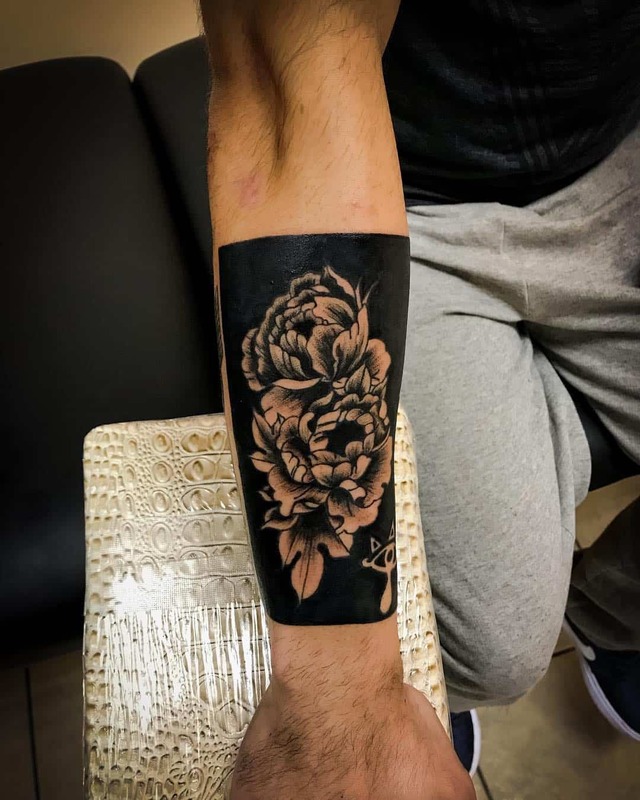 Peony floral tattoo is one of the appealing negative space tattoos that you can get on your forearm. Peony flower symbolizes the luck, beauty, wealth, happiness, and compassion. 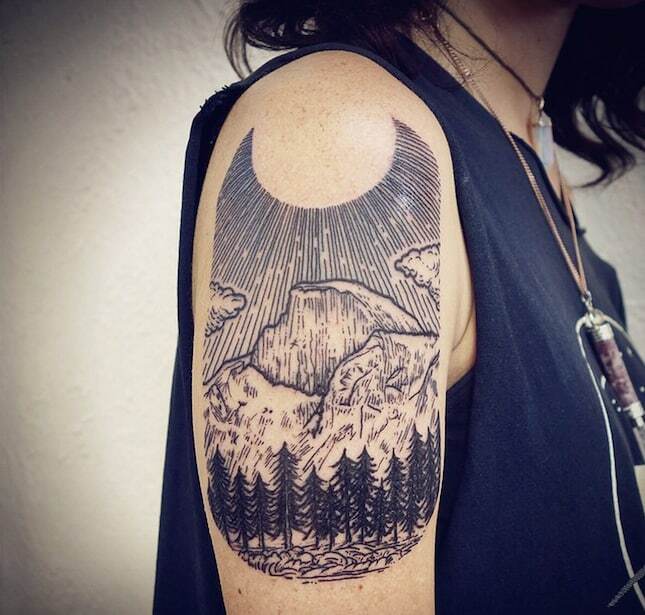 This tattoo will surely lead you towards fantasy. 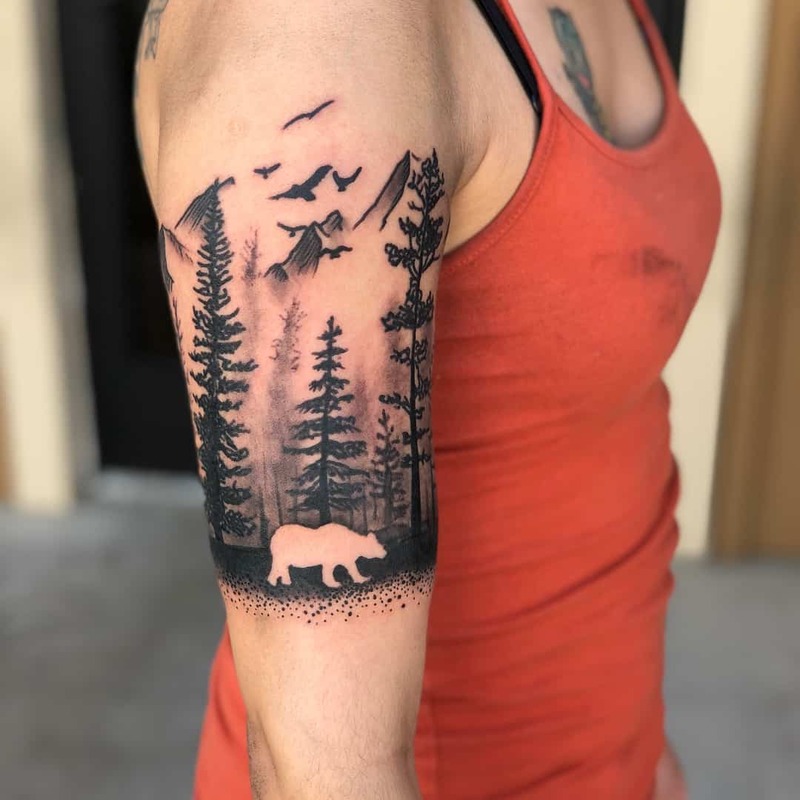 An incredible picturization of the bear, forests, birds, and mountains in the form of negative space tattoo. Bear symbolizes the leadership, strength, bravery, and motherhood. Flying birds symbolize freedom and prosperity. Pine trees symbolize the virtue. Mountains symbolize the determination and eternity. What a beautiful piece of art. The aggressive lion symbolizes the pride, bravery, and strength. Eagle face below the lion face symbolizes the purity, focus, and inner beauty of a person. Finally, the silhouette gets the attention which reveals that the lion and the eagle represent the courage, purity, beauty, and bravery hidden in a woman. Impressive one! 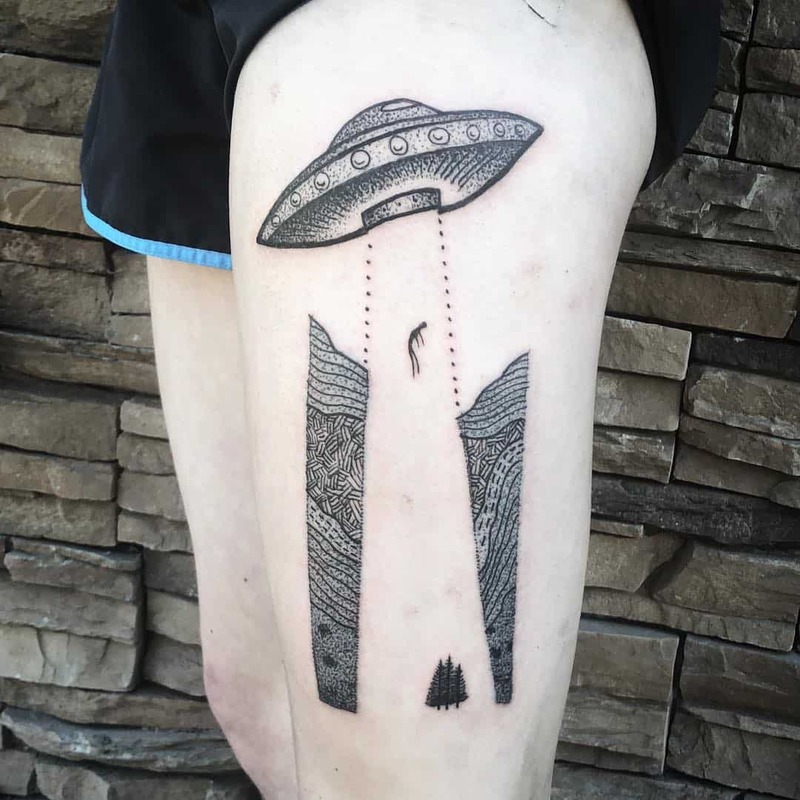 Alien abduction as a negative space tattoo illustrated very well on the person’s thigh. Here, pine trees symbolize the abundance. The line and beam work have done very professionally. 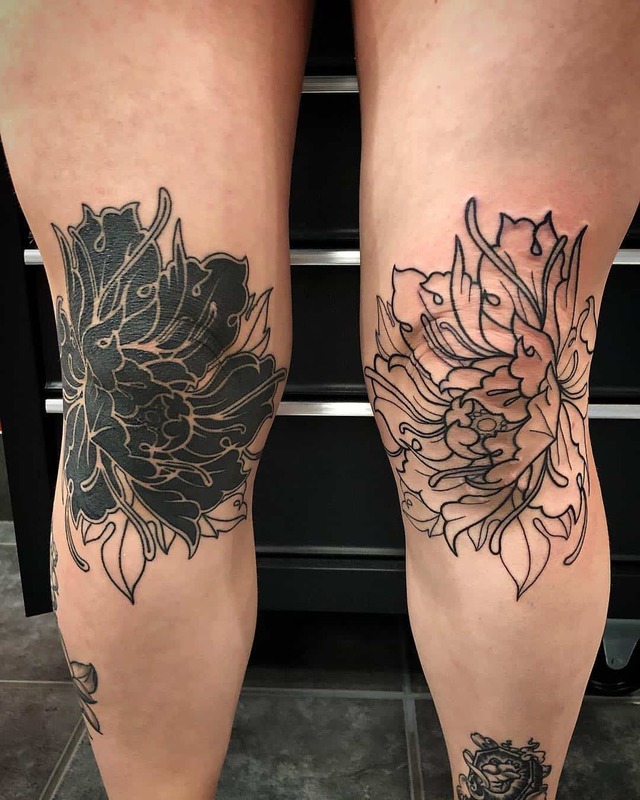 Are you brave enough to get the negative space tattoos on your knees? It is true that getting a knee tattoo is a very painful process but once it’s done, the end results will make you forget the whole pain. 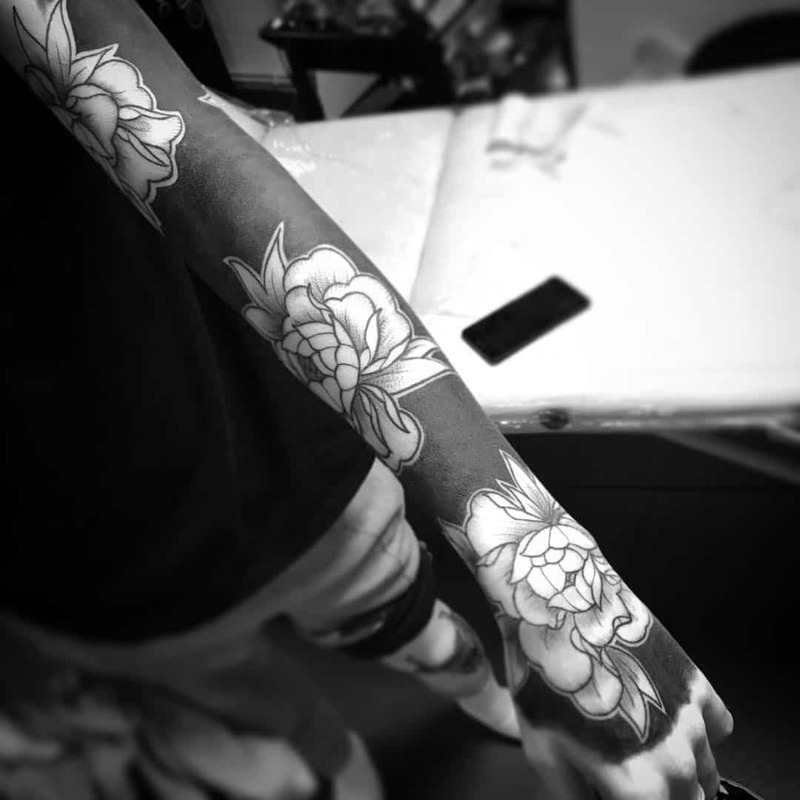 You can have any flower tattoo that you like the most. Dynamic black negative space tattoo is an adorable as well as cool choice to have it as a sleeve tattoo. Don’t confuse these flowers with a rose as these are actually peony flowers. Peony floral tattoo symbolizes the beauty, good luck, wealth, and happiness. Want to have a simple tattoo? Go for a blanket tattoo at the “calf” area of your leg. It has intricate designs with bold boundaries which makes the circle more prominent and circle symbolizes the wholeness, divine, and protection. 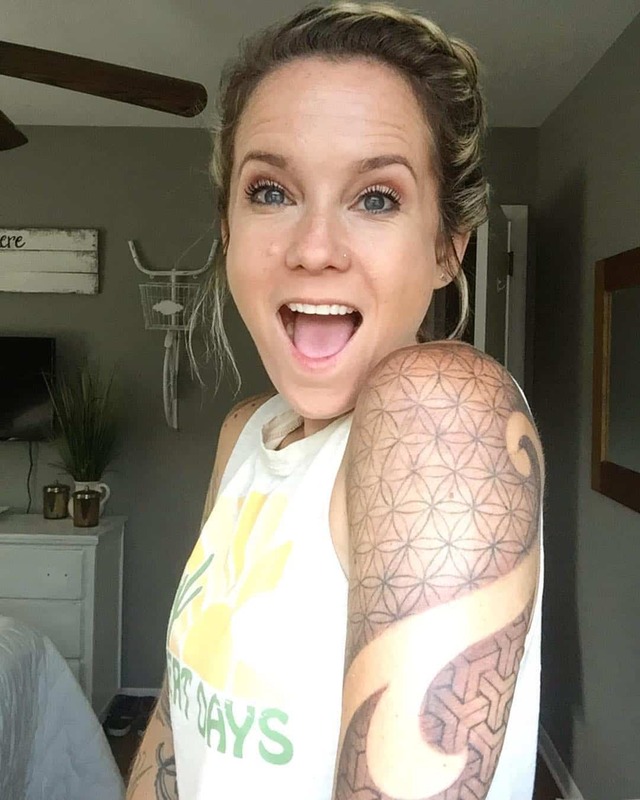 This tribal sleeve tattoo looks remarkable as a negative space tattoo. These are simple as well as striking in appearance. Try this out and mesmerize others by your choice. A flowery snake? Seriously! 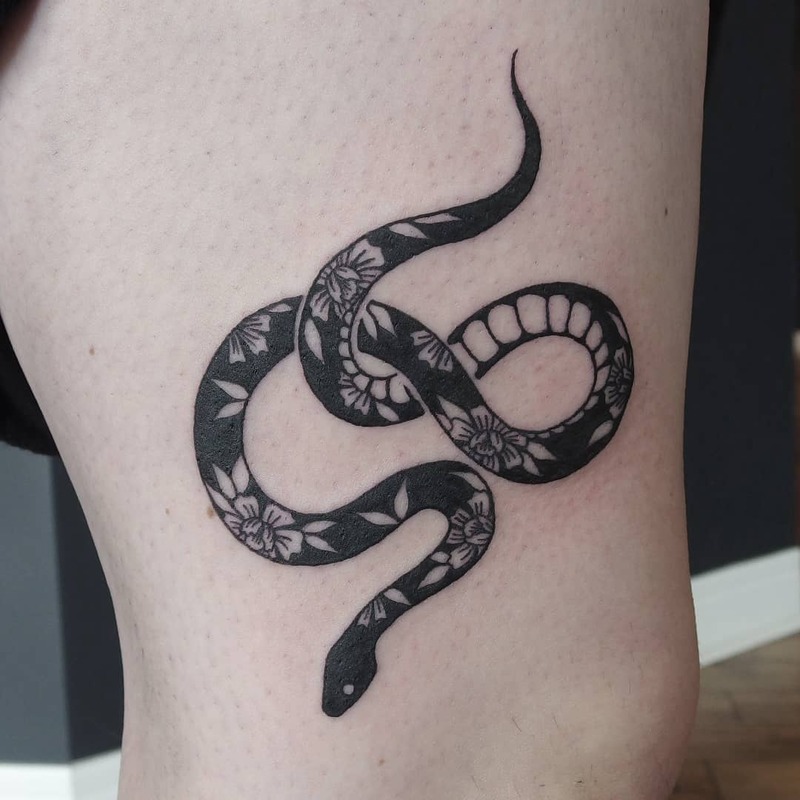 In this tattoo flowers and some segments of the snake, body tattoo occupies the negative space. Snake tattoo symbolizes the death and rebirth cycle. Camellia flower tattoo symbolizes the perfection and empathy. 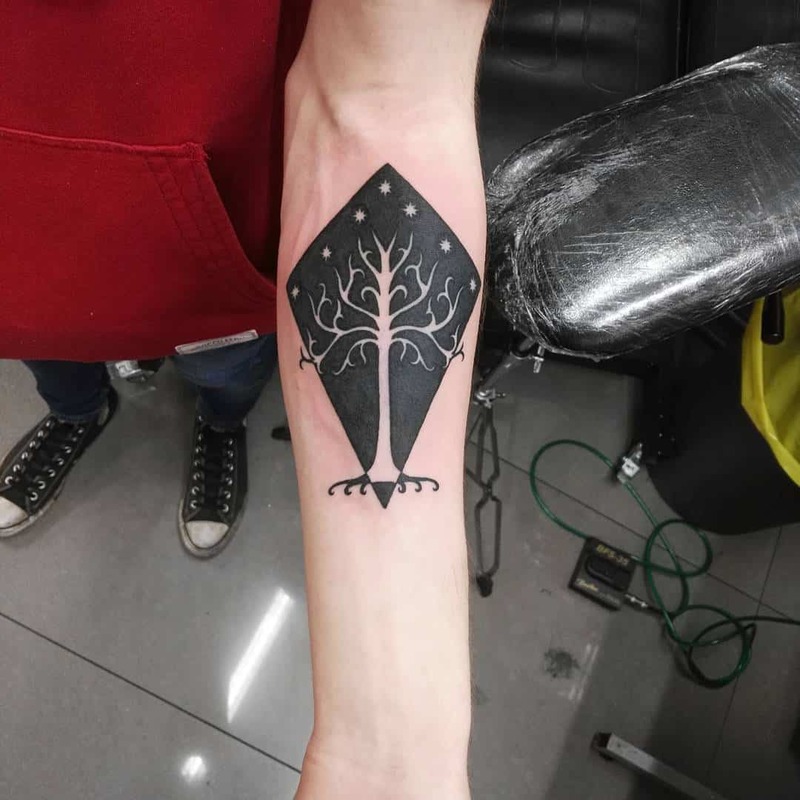 White tree of Gondor as a negative space tattoo is undoubtedly an amazing idea for those who like fictional stories. It is used as a symbol of friendship. If you are unaware of this white tree then do watch The Lord of the Rings: The Return of the King. 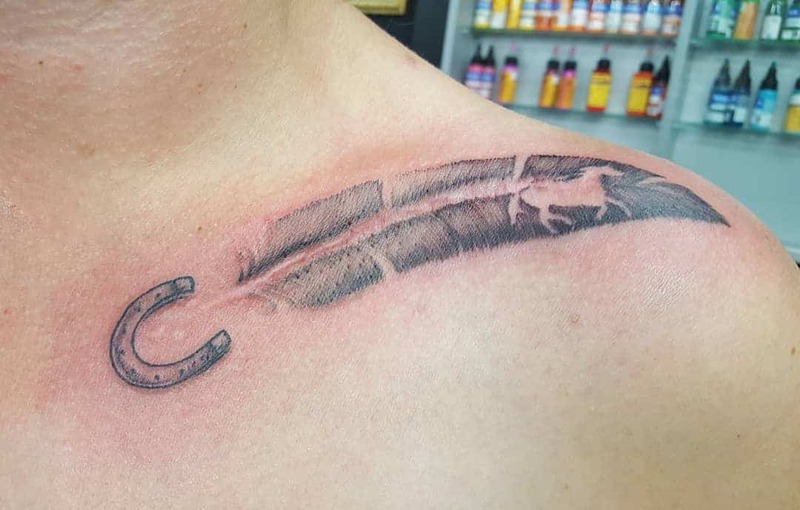 After watching this, you will clearly understand the meaning behind this negative space tattoo. 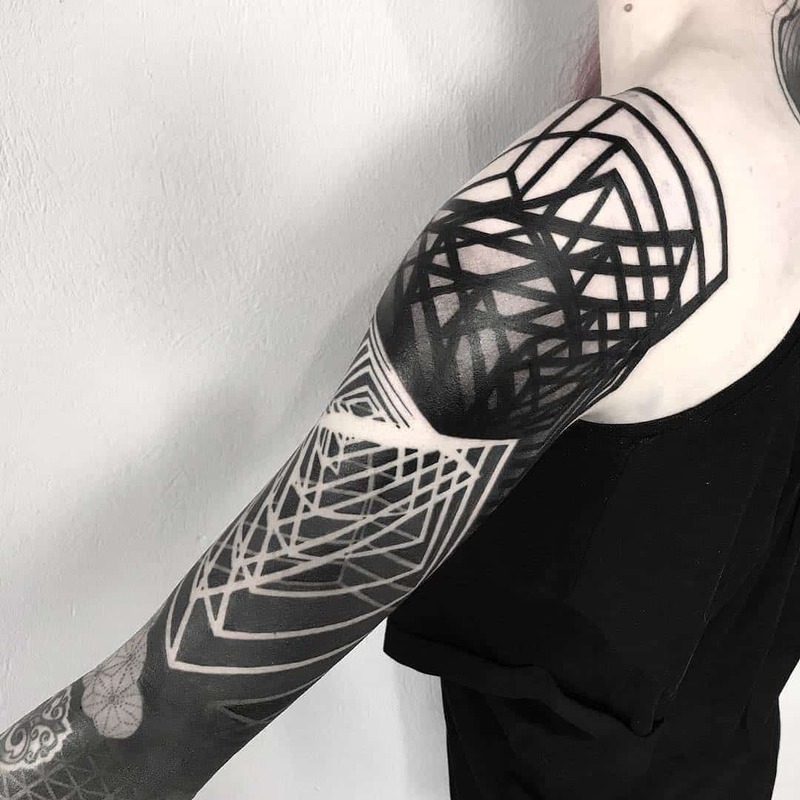 Geometric negative space tattoos are considered as a sacred thing amongst people of different regions. If you are one of them then, this incredible design is particularly for you. It is a delicate and intricate negative space tattoo. 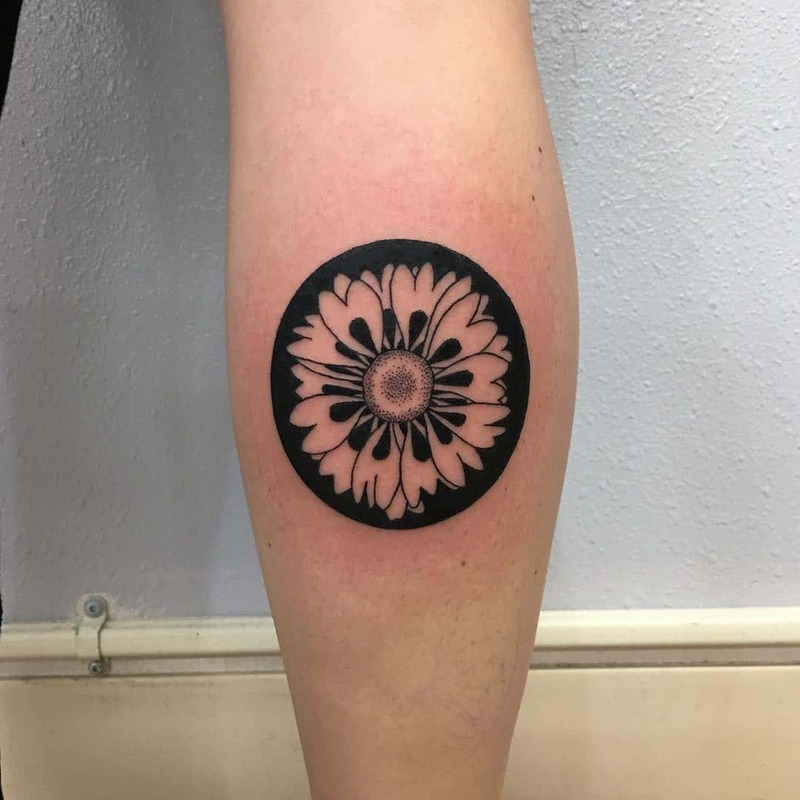 If you love nature and flowers, you must go to have this botanical negative space tattoo on your half sleeves. 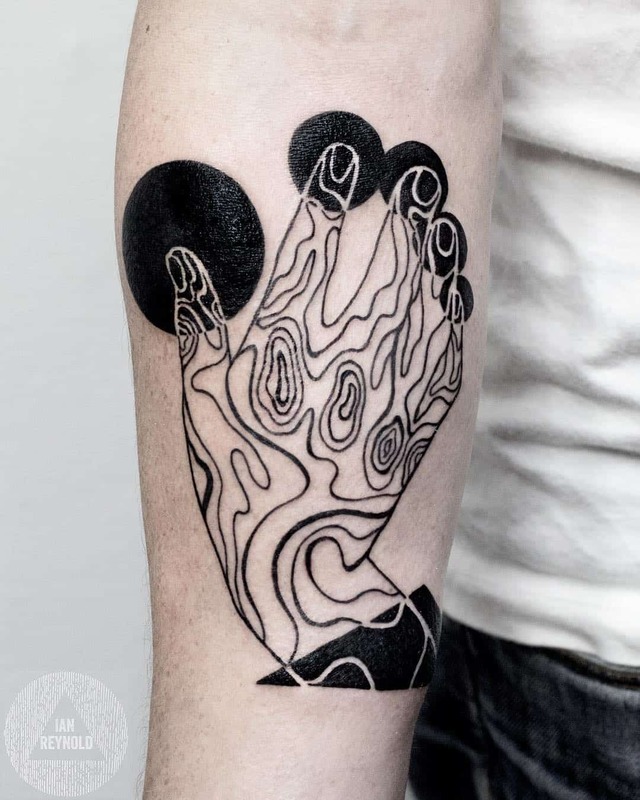 Hand topography as a negative space tattoo is a brilliant idea and executed very well. If you got impressed with this innovate idea, try this out on your forearm. You can have the topographical map of any region you like or belong to. 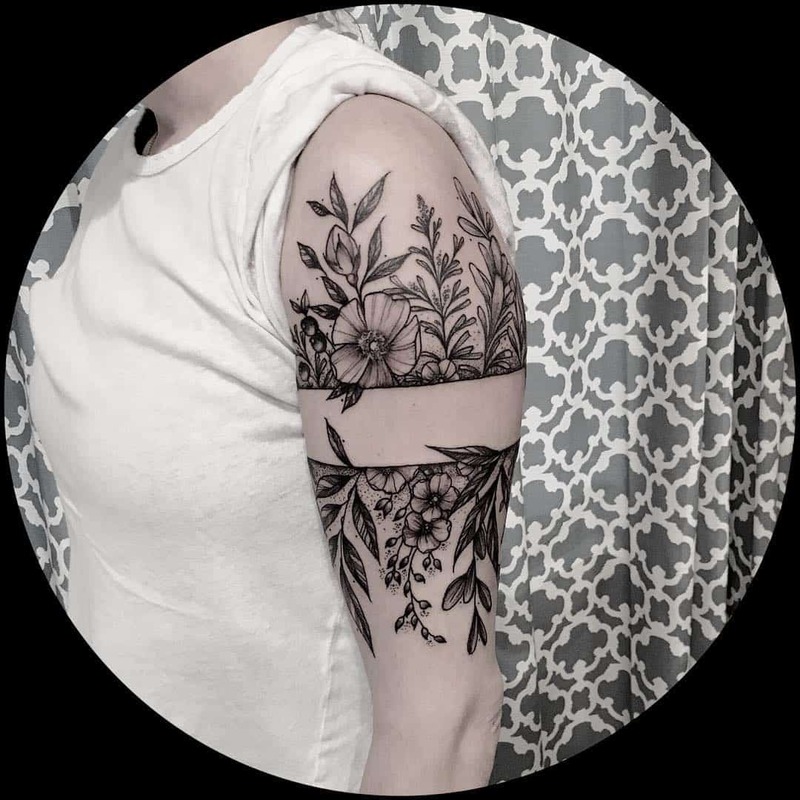 It is another sleeve tattoo with simple lines that refer as the negative space tattoo. 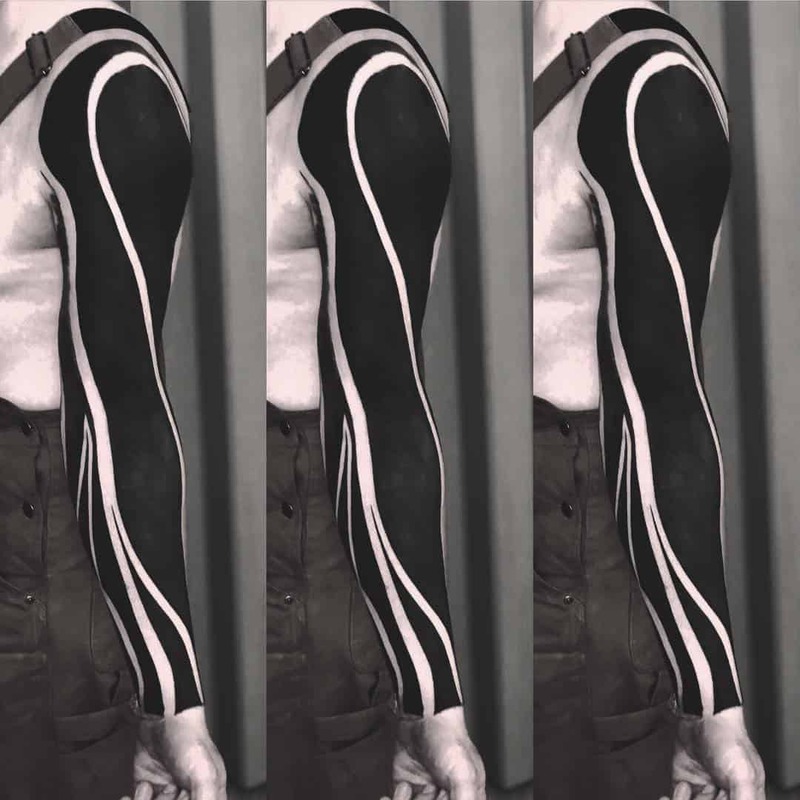 It is just like a monochrome image which always confuses people that it’s actually a tattoo or a clothing piece. Viking symbol negative space tattoo is particularly for those people who want to create their own reality. If you are one of them, you will love to have it without a single doubt. 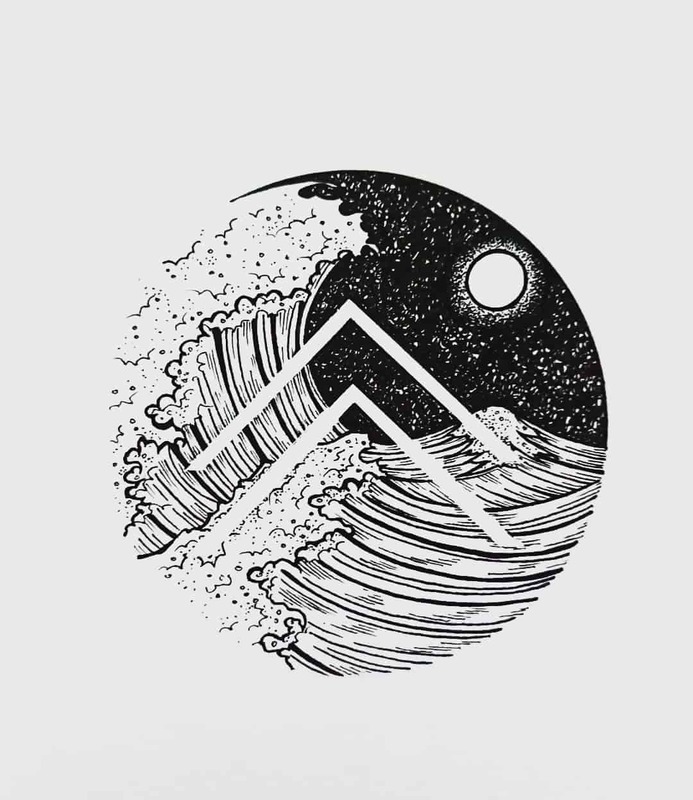 The water waves symbolize the hardships, enthusiasm, and emotions. Bravo! To the choice of girl who has taken this incredible tattoo on her hand. 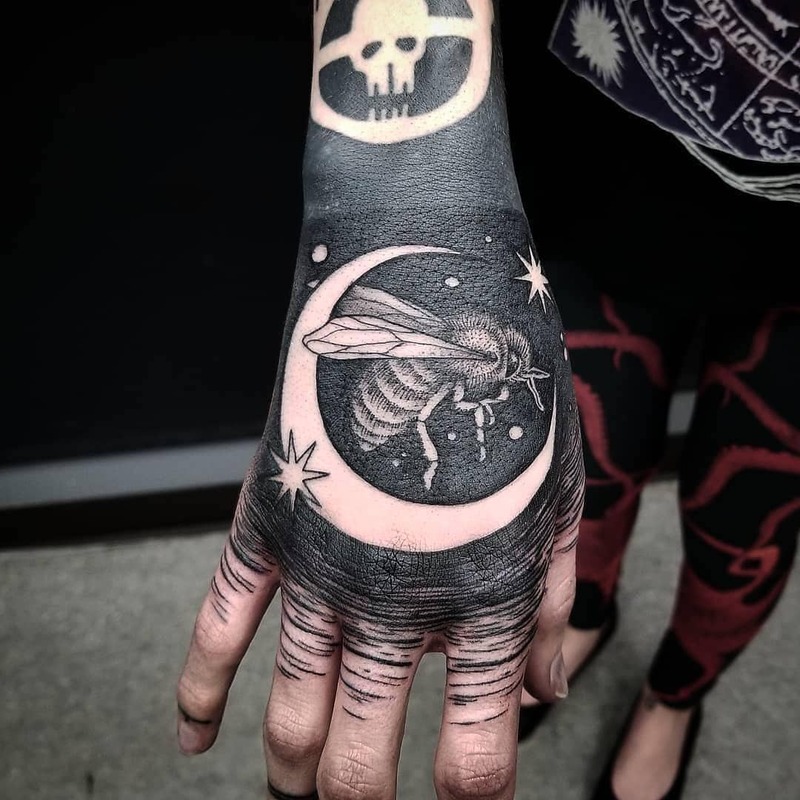 The crescent moon, sparkling stars, skull, and the honey bee tattoo occupy the negative space. All these tattoos explain very strong meaning .i.e. Crescent moon symbolizes the growth and birth cycle, honey bee symbolizes the hard work and loyalty, and sparkling stars symbolize the guidance and good luck. Inspired by sea live? 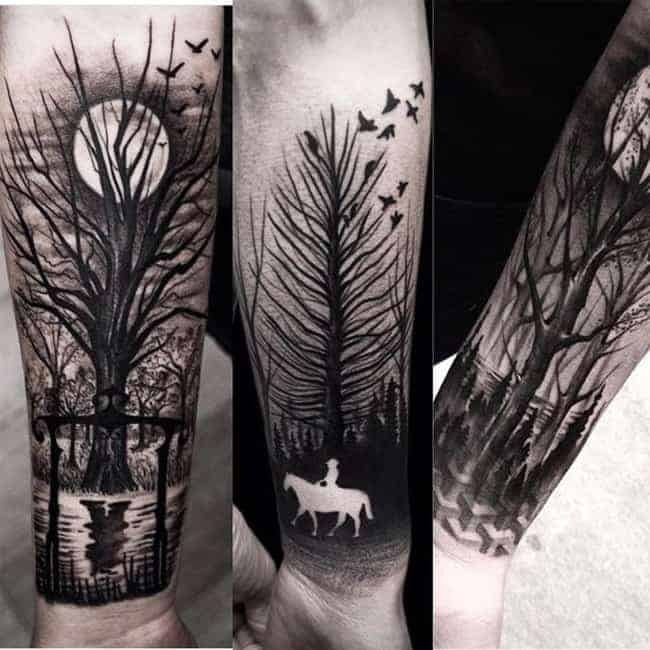 Then, you will surely love this enchanting negative space tattoo on your arms. 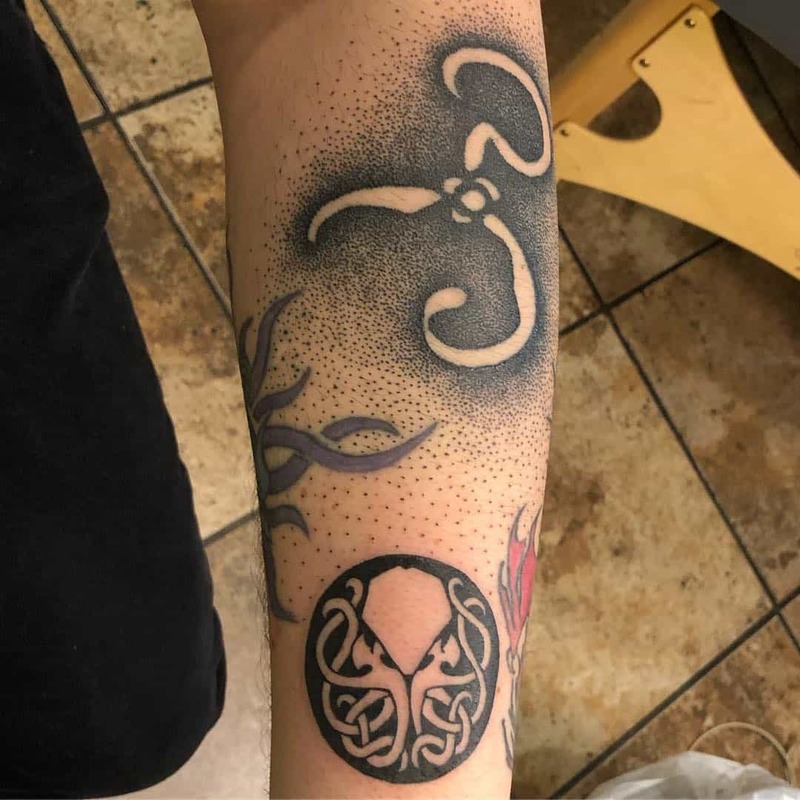 Octopus symbolizes the power, cleverness, variability, and mystery. 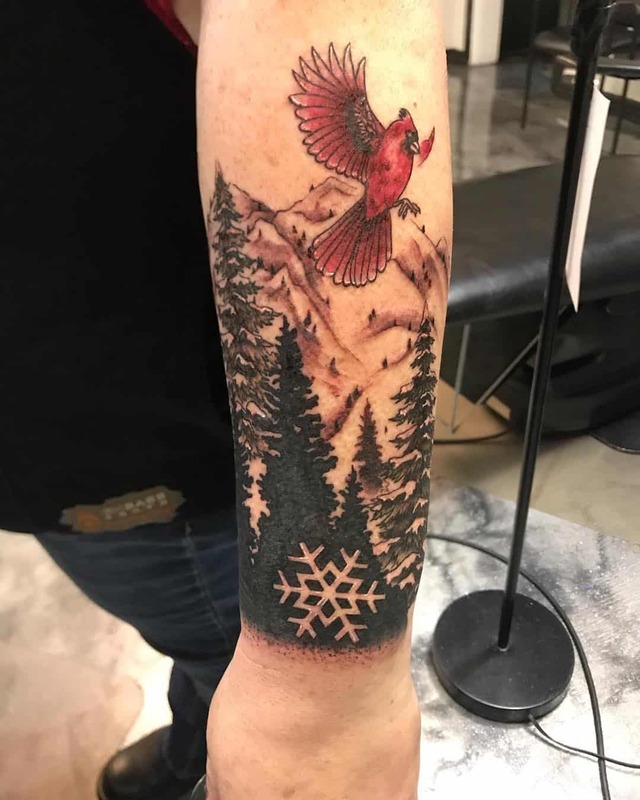 Redbird, forest, and snowflakes sign, what a striking combination to get on your arm as a negative space tattoo. Redbird because of its bright color adds life to the whole tattoo. Redbird symbolizes the protection, determination, happiness, energy, royalty, and aggressiveness. Snowflake is representing the coldness. Simple but elegant! The heart as a negative space tattoo symbolizes the love, compassion, friendship, and harmony. 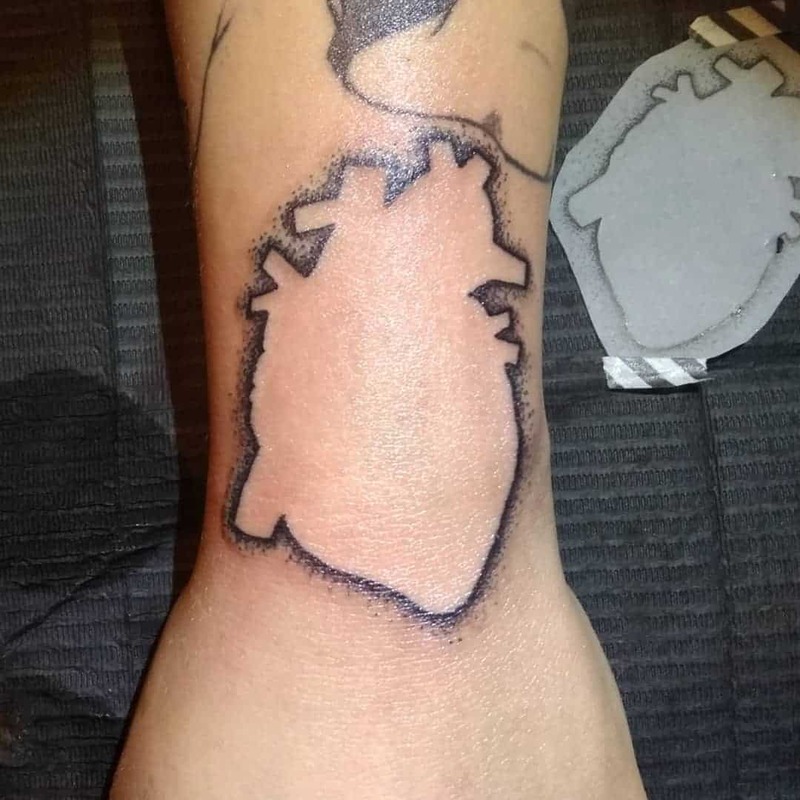 This particular heart tattoo made through a dotting tattoo process which is actually known as stippling. 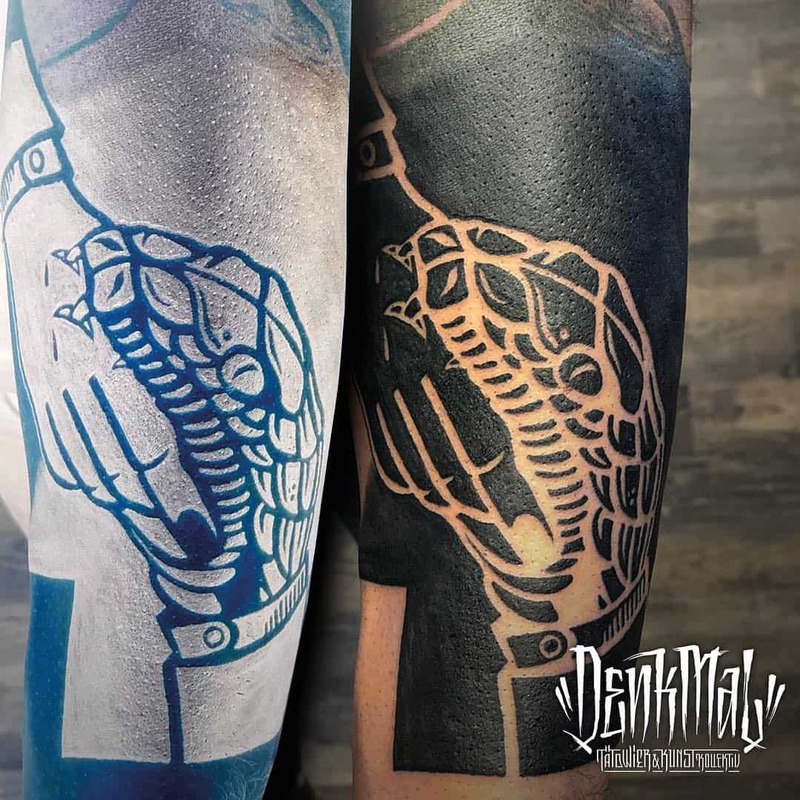 No doubt it is an artistic way to give a strong message to people by showing them this awe-inspiring negative space tattoo. The snake cutting the human hand symbolizes that you should not trust everyone you meet in your life even if they are your close friends. It is really a great way to show your satisfaction and affection for someone or about matters of your life. 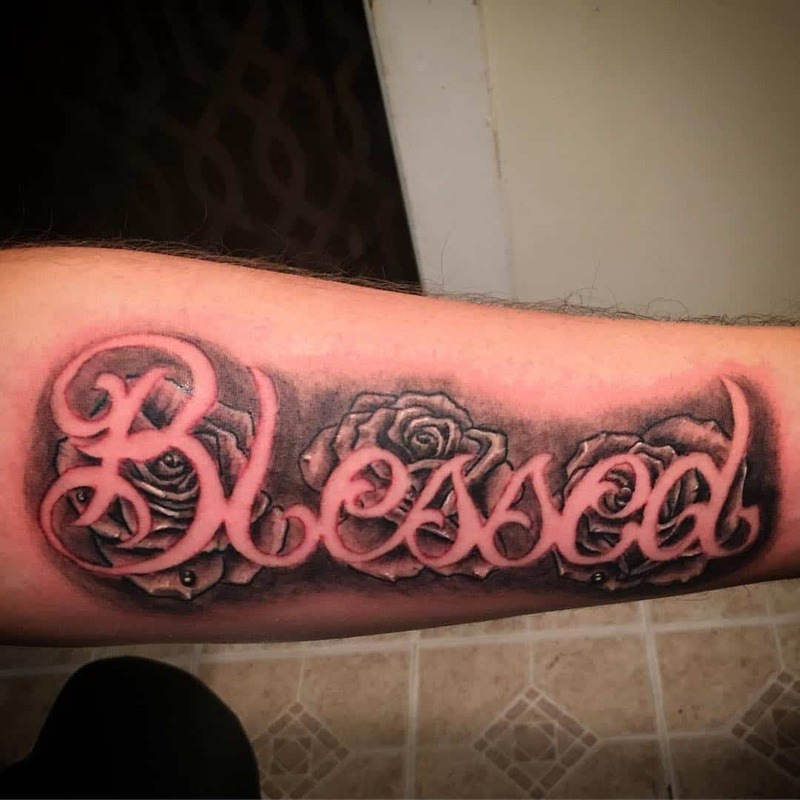 The word blessed tattoo occupies the negative space. Rose symbolizes the balanced life, new beginning, and hope. You can customize the lettering tattoos. You can choose the font of letters as well. 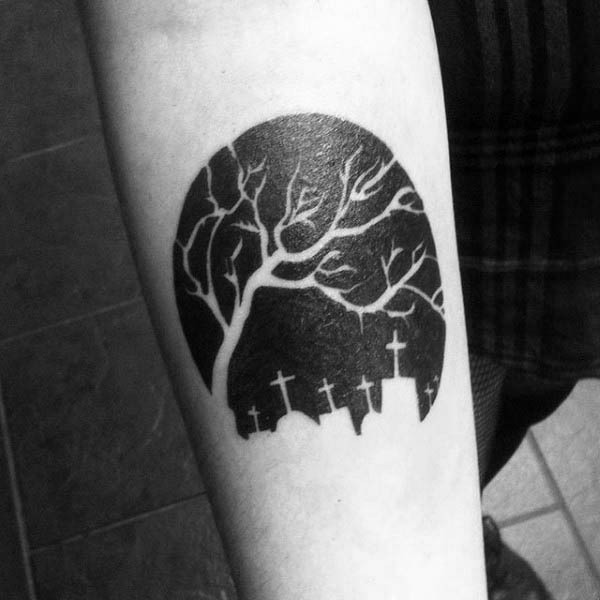 What an epic illusion in the form of negative space tattoo. The magnet is attracting the horse that is running through the path created by splitting of a feather. The shoulder is a remarkable spot to have this tattoo on. It looks undoubtedly so fabulous. 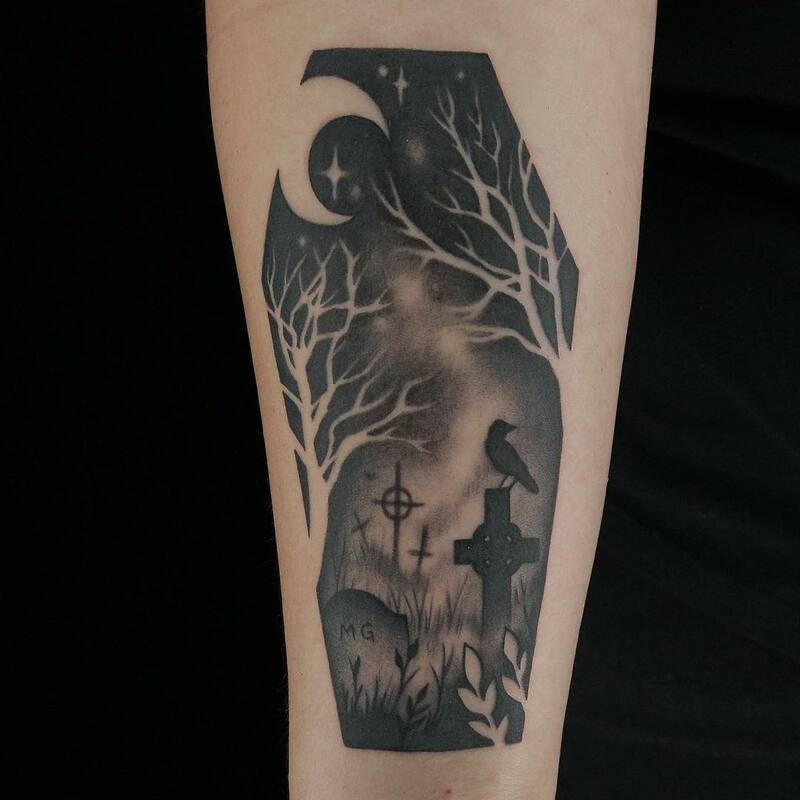 The trees, leaves, and crescent moon occupied as negative space tattoo. The details are quite awesome and professional. Leaves symbolize the growth. Really amazed to see the skills of the person, who did this beautiful art as a negative space tattoo on the back of his client. 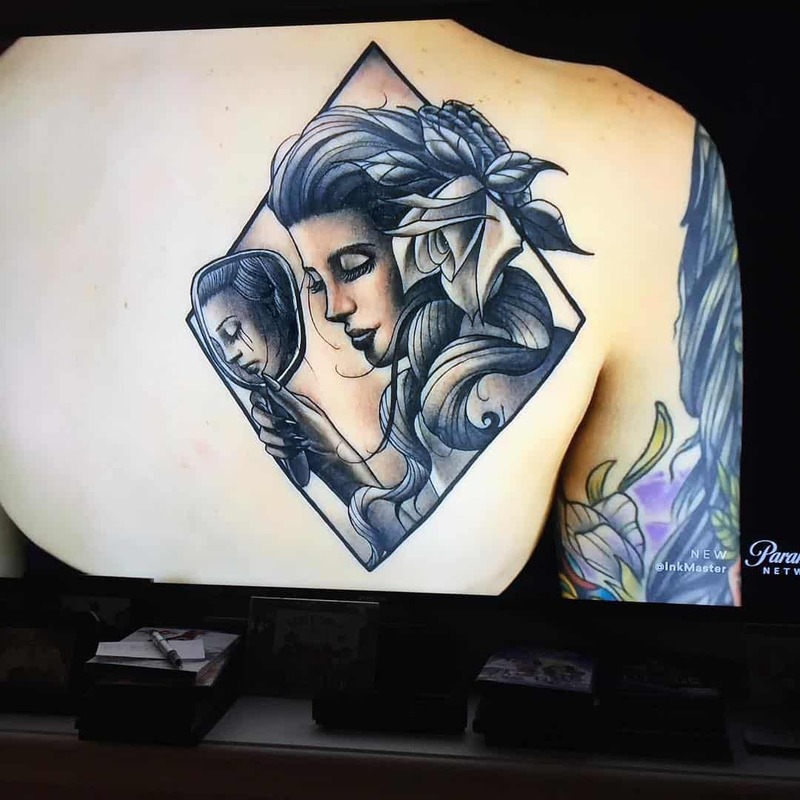 A girl tattoo holding a mirror with her reflection. The contrast, depth, and the details just up to the mark. You will hesitate to get a fly tattoo on your body because of its annoying character. 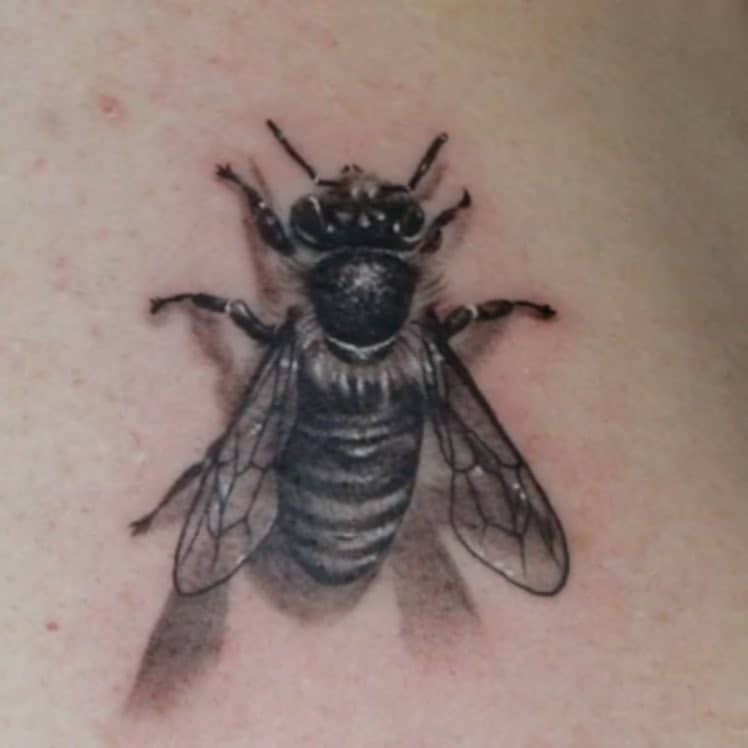 But having a fly, as a negative space tattoo possess a completely different meaning. Fly tattoo actually symbolizes the perseverance and mostly taken for a good business approach. It is one of the cutest negative space tattoos and executed adorably. 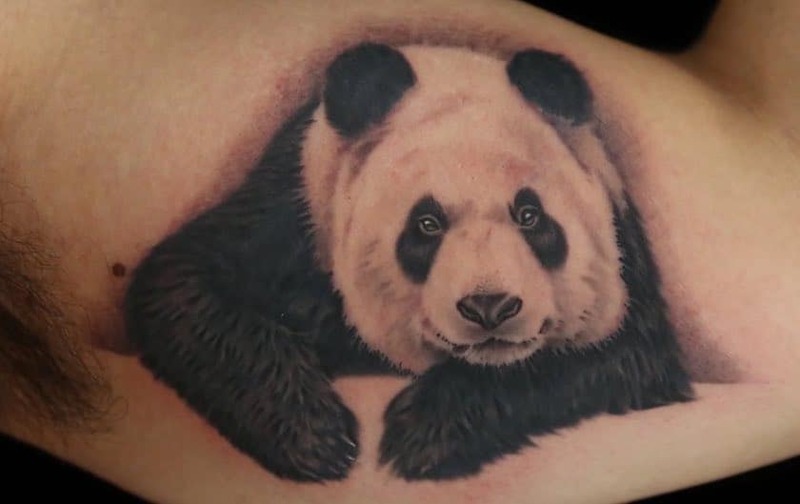 Panda tattoo symbolizes the positivity and protection.